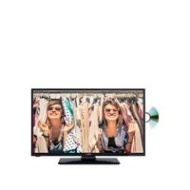 alaTest has collected and analyzed 309 reviews of JMB 24in HD Ready Freeview LED TV With DVD. The average rating for this product is 4.7/5, compared to an average rating of 4.6/5 for other products in the same category for all reviews. Reviews about the sound and size are generally positive. The price and image quality are also appreciated. Many are negative about the reliability. We analyzed user and expert ratings, product age and more factors. Compared to other products in the same category the JMB 24in HD Ready Freeview LED TV With DVD is awarded an overall alaScore™ of 89/100 = Very good quality. Great TV for bedroom. Clear picture and quick to set up. Next day delivery fantastic. Reduced too. Great. I bought the tv/dvd for a friends bedroom. They are over the moon with it. Good size for the room. The picture and colour quality are exellent,so too is the sound. Well pleased. Excellent tv I bought this for my little boys birthday.